Use our resources to learn more about oil spills and their impact on ecosystems and human activity. At least 500 barrels of crude oil spilled into the Magdalena River in Western Colombia earlier this month. Hundreds of barrels of petroleum have spilled into a river in Colombia. What is petroleum? Skim through our great reference resource for some help. Petroleum is a liquid or mostly liquid fossil fuel. Like all fossil fuels, petroleum is formed as the remains of ancient marine plants and animals are buried and subjected to intense heat and pressure over millions of years. Today, petroleum is found in vast underground reservoirs where ancient seas were located. Petroleum reservoirs can be found beneath land or the ocean floor. Their crude oil is extracted with giant drilling machines. The oil field explored in the area of the spill is the Middle Magdalena Valley. Here’s a map of the area. The type of petroleum that spilled was crude oil. What is crude oil? Crude oil is a thick, sticky substance made of differing chemical compounds. Light oils can contain up to 97% hydrocarbons, while heavier oils and bitumens might contain only 50% hydrocarbons and larger quantities of other elements (such as nitrogen or sulfur). How did the oil spill in Colombia happen? Authorities aren’t sure. Ecopetrol, the state-owned oil company many conservationists blame for the spill, is investigating the incident. What we do know is that between 550 and 2,400 barrels of crude oil spilled into the Magdalena River, and the oil has since spread to other waterways. How has wildlife been impacted by the spill? trees and wetland plants. More than 1,000 tree species were damaged. As these key autotrophs are damaged, they have a spiraling impact on wetland ecosystems. Dig deeper into how oil spills impact trees with our activity. fish. Hundreds of fish have suffocated, others have been poisoned, and still others left with dwindling food sources (mostly insects, freshwater plants, and other fish). birds. Oil damages feathers, making flight, nesting, and accessing food difficult. Learn how oil impacts the health of local and migrating bird populations with our activity. reptiles. Oil can damage reptiles’ delicate skin and eyes, and limit their ability to nest and access food. Learn how oil disrupts reptile health and habitat with our activity. cattle. 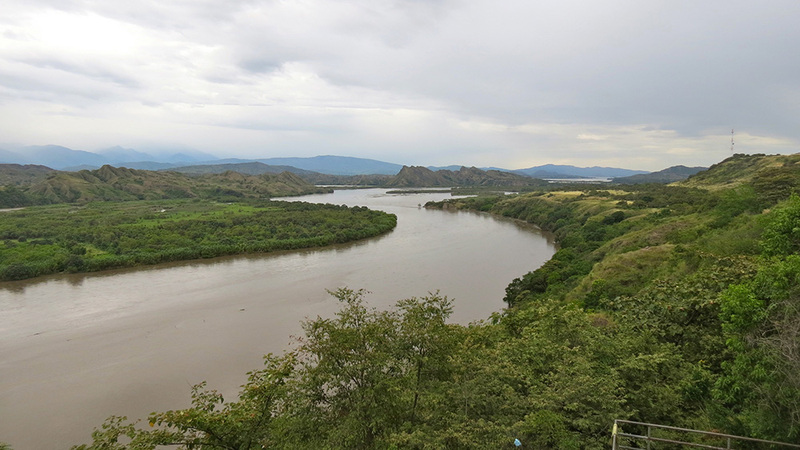 The Magdalena River runs through major agricultural areas in Western Colombia. Cattle can become ill and even die from ingesting oil-contaminated grass and shrubs. How has human health been impacted by the spill? Health problems associated with exposure to oil include vomiting, headaches, dizziness, “respiratory issues, skin rashes, fatigue, and seemingly undiagnosed illnesses lasting months or years.” Learn more about the potential dangers posed by exposure to the oil industry with our article. Food sources, including protein-rich fish, have been contaminated, limiting the food choices of many residents. How has the economy of the region been impacted by the spill? Dozens of families have been forced to relocate. This increases expenditures and limits income. Hundreds of people have sought medical attention, limiting their ability to work or attend school. The environmental impact on agriculture has devastated the economy and limited food resources available to the local population. Nat Geo: What is petroleum?